David Zwirner announced yesterday that his gallery will add Beijing-born artist Liu Ye to its roster, making Liu the first Chinese artist represented by Zwirner since unveiling its Asia expansion in 2015 and opening its Hong Kong space in 2018. The gallery is set to show Liu’s work at Art Basel Hong Kong this year and in a solo show in New York in 2020. Liu Ye. Photo by Shen Siyuan, courtesy of the artist and David Zwirner, Artsy. Born in Beijing in 1964, Liu studied mural painting at the Central Academy of Fine Arts and industrial design at Beijing’s School of Arts and Crafts before going on to study at Berlin’s Hochschule der Künste. Liu then spent six years in Europe including a six-month residency at the Rijksakademie in Amsterdam. 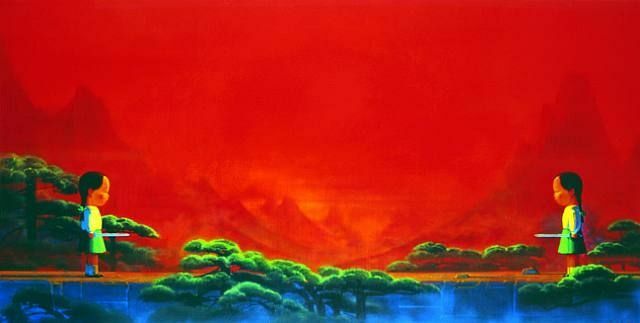 Widely exhibited in Asia, he set an auction record of $5.5 million at Sotheby’s Hong Kong in 2013 for Sword (2001-02), an image reminiscent of Song dynasty landscape paintings with its depiction of trees and bold red background. Liu Ye, Sword, 2001-02, oil and acrylic on canvas, Sperone Westwater Gallery, New York. Liu Ye, Little Finger, 2000, oil on canvas, Triumph Art Space, Beijing. Having previously shown in New York at the Sperone Westwater gallery, Liu believes Zwirner’s New York space will bring a new feel to his works in the 2020 solo exhibition. “The space is filled with a kind of slow and classic atmosphere, and I really like its sense of temperature and intimacy,” Liu says. With a roster mostly comprised of American and European artists, Zwirner joins other New York based galleries such as Gladstone, Gagosian, and White Cube, who have been focused on adding Asian artists to their rosters as they increase their presence in Asia. Prior to the expansion in Hong Kong, Zwirner represented Shanghai-born, Paris-based artist Yan Pei Ming, Japanese artists Yayoi Kusama and On Kaware, and Korean-born Yung Hyong-keun.